Tags: Live band recording, Recording newbie guide. 1.) 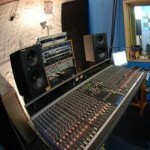 Capability of your recording equipment and room. 2.) Your aim as a producer (pertaining to the style of the song and attitude of the band). 3.) Availability of the musicians in the recording venue and time. First, you need sufficient number of microphones and cables. There are least 4 microphones needed together which is a combination of condenser and dynamic microphones. Recording vocal needs one condenser microphone. Recording drums need at least two condenser microphones for left and right overheads and one dynamic/condenser for kick drums. This assumes you record drums with only 3 microphones. If your ambition is getting a full drum sound, you need more microphones. This setup assumes you are recording guitars and basses in DI mode and not using amp. If you would like to use an amp when recording guitars and bass; then you need more than 4 microphones. Recording bass and guitars using DI is also an added advantage in minimizing bleeding of sounds during recording (such as getting the guitar sound bleeds into the vocal microphone thus recording the unwanted guitar sound). Second, you need an effective isolation of instruments sound in your room. 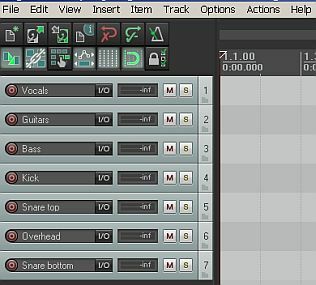 The vocalist needs to be placed in an area with minimal bleeding of other instruments sound into the vocalist microphone. This can be a challenge because the vocal microphone is very sensitive to other sounds (since it is a condenser microphone). This implies that your vocalist will be placed in an isolation vocal booth free of leaking drum sounds and guitar amp sounds. For recording guitars and bass using DI, there will no issues with bleeding as there are no microphones involved. 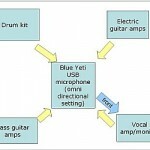 For recording drums, there can be issues of having the vocal sounds bleed into the drum microphones if the vocalist is not well isolated with the rest of the instruments. Third, you need an audio interface that can accept around 8 pre-amp inputs. Why? You need one pre-amp input for your vocals, one pre-amp input for your guitars, one preamp input for your bass, and three preamp inputs for your drums (six inputs to be used). 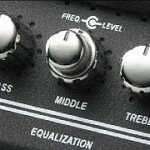 If you are using two microphones for your guitars with an amplifier (stereo recording or double tracking technique) then you need 7 pre-amp inputs. Audio interface with this capability requires very low latency recording so you should be using ASIO compatible DAW and not WDM. This is most likely a Firewire audio interface and can be an expensive audio interface (somewhere around $500). Lastly, you need a DAW with multi-track recording capability in ASIO mode and a big hard drive space for saving high resolution digital recording (which is either a 24-bit/48KHz format or 24-bit/96KHz). If your budget is limited, you can only track one at a time. 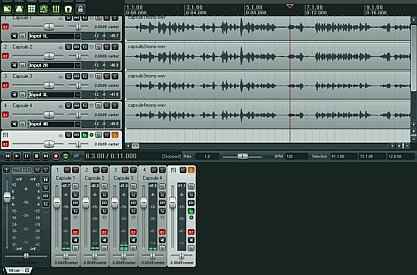 To track one at a time, you should have at least DAW software with multitrack recording feature, an audio interface with at least 2 pre-amp inputs (if you need to record drums, look for audio interface with at least 4 pre-amp inputs). 2 condenser microphones and one dynamic microphone is enough for one at a time recording. You can use these microphones to track all instruments. Sometimes it is not only limited and decided by recording equipment’s alone; the decision to record the band live or one at a time depends on the recording producer objectives. For example, the recording producer finds out that the band would sound better if they are recorded live because of the energy when they jam together. 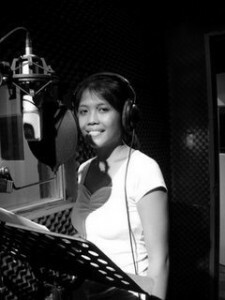 There are also instances that the producer decides to record one at a time. An example is to emphasize difficult guitar solo or vocal sections. There are also instances where recording one at a time is necessary especially if the producer will be doing overdubs or layering of tracks (like a double guitar recording or double vocals recording). Most rock band recordings are a combination of two techniques (recording live and one at time recording). At first, the band is recorded live primarily to record drums then the producer will track the rest of the instruments one at a time in an overdub sessions. The last consideration whether to record the band live or one at a time is the availability of musicians. As you might have expected; it is almost impossible to group the entire session players together in a single venue in a tight recording schedule. This is because the hired session players might be living in different faraway places. Thus, the only solution is to record them one at a time. At first, the drummer and primary musical instruments (guitarist or bass players) are recorded live. Then the producer will book separate schedule for the rest of the musicians which can be done in different recording studios at different time. 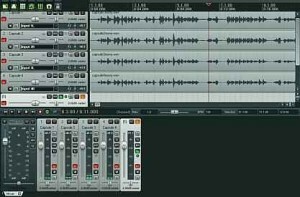 Doing this way, the entire multitrack recording project can be completed even though some musicians are not available for recording at the same place or time. This is a beginner tutorial on controlling bleeding in multi-track recording by implementing proper isolation techniques. As a background, bleeding is a serious issue in recording where undesired audio are captured during recording. To better understand bleeding and how it can seriously affects your multi-track recording project, say for example you are recording a band. You decide to place the band in a single room and then you place a microphone on the vocalist, one microphone on the guitar amp and one microphone on the bass amp. The drum also needs at least 4 microphones. All in all there are around 7 microphones in a single room. Can you guess what will happen next? Yes, there will be extreme bleeding. 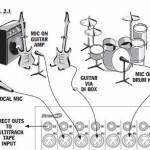 As they start playing; the drum sound will go into the vocalist microphone, or the guitar amplifier sound will go into the drum microphones, vice versa. In all microphones; there will be serious bleeding of sound. Supposing you are done recording the band and then you start mixing your multi-track project. This is where serious problem will start to occur. First, the track is not an accurate representative of the instrument recorded because it substantially contains recorded audio of other instruments. Second, since the track is not an accurate recording, applying EQ, compression and other effects can be less effective or even futile with extreme bleeding. Finally, your mix sounds dull and confusing since tracks does not seem isolated properly in the mix. This is why bleeding needs to be controlled during the tracking or recording process. How? Different record producers and engineers have different approach in controlling bleeding during recording. Let’s discuss the two common methods.